The latest details on the industry, as curated by Boardgame Babylon – the ultimate authority on modern designer board games. New games for this big anniversary include a fruity frenzy, a blooming bouquet, a rock -n- roll card game, and Sushi dice! Newton, MA – Gamewright, a leading publisher of award-winning tabletop games, has been in the game of making “games for the infinitely imaginative” for 25 years. In celebration of this milestone anniversary, the company will roll out the red carpet for a pair of “rolling” releases based on two of their best-selling titles: Sushi Roll, a dice version of the hit card game Sushi Go! ; and Rat-a-Tat Roll, a board game based on the million-selling Rat-a-Tat Cat. Additional new releases include This Game Goes to Eleven, a rock and roll themed card game that cranks up the fun; Whozit?, a cooperative “guess who?” party game; and Bloom, a new signature “roll and write” dice game where picking colorful flowers is the key to victory. These, along with six other new titles, will launch at Toy Fair in New York City this February 16-19. Guju Guju – a fast-playing “fruit frenzy” card game, sold in a tin. Rat-a-Tat Roll – a follow-up board game to the best-selling Rat-a-Tat Cat. Sushi Roll – A dice version of the million-selling Sushi Go! card game. This Game Goes to Eleven – a rock ‘n roll themed card game that “cranks it past 10”. Punto – a neat twist on “in-a-row” games, packaged in a miniature flip-top tin. Bloom – a flower themed dice game, to complement the best-selling Qwixx. Whozit? – a cooperative “guess who?” party game. Hello My Name Is – a new Port-a-Party game designed around the well-known name tag. Editor’s Note: Boardgame Babylon congratulates Gamewright on their Silver Anniversary. It’s a great game company that has made family games that delight casual gamers as well for a long time, and I appreciate the quality and ingenuity they bring to their productions. Here’s to another 25 years (and more) of success! 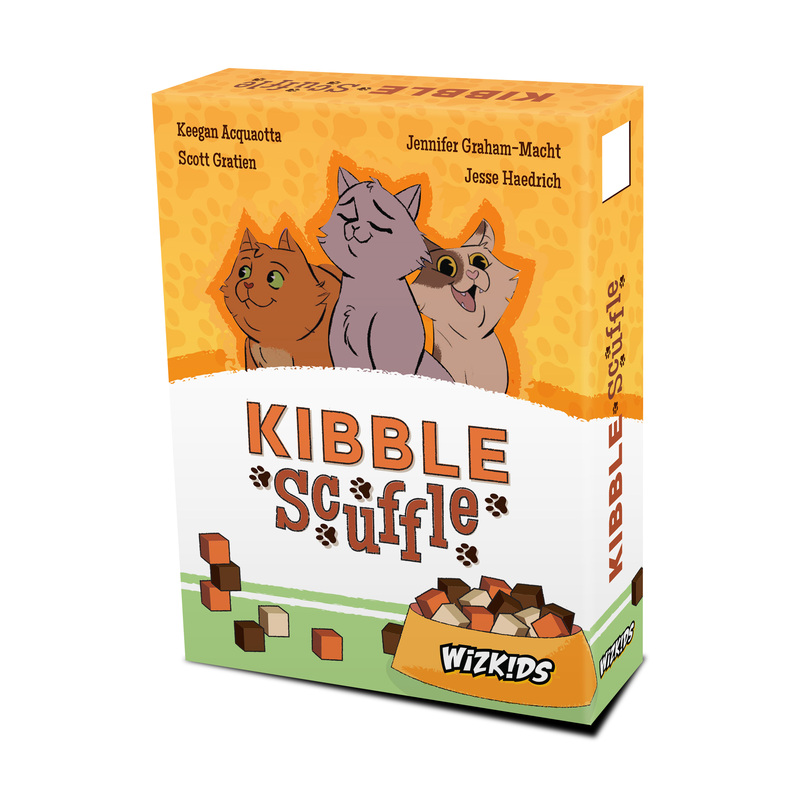 Hillside, NJ – January 16, 2019 – WizKids is excited to announce that Kibble Scuffle, an adorable romp through feeding time with your mischievous feline friends, is coming soon! Using the game box as a cat food box to store the food cubes, players take turns placing their cats at bowls and resolving their abilities. For example, the Pounce Cat removes a cat at a bowl. The Greedy Cat eats two food cubes. The Mangy Cat forces another cat to move away from their bowl. Once there are 5 cats at any food bowl, the feeding (scoring) phase begins, followed by a new round. Kibble Scuffle is a tactical card game of area control to try and get the best food for your feline friends. With cards like the Robo-Vac and Laser Pointer, you can use toys to strategically distract your opponent’s cats. Once a player reaches 20 points, the player with the most value of food cubes eaten at the end of the feeding phase wins. LOS ANGELES – Jan. 7, 2019 — Investment in game-based learning companies was sharply up in 2018, according to leading serious games analyst firm Metaari. A total of $2.25 billion went to 133 companies. In contrast, less than half that amount, or $948.2 million, was invested in 150 game-based learning companies in 2017. While the number of deals declined slightly in 2018, funding levels were much higher and investment more than doubled. Almost 100 companies reported raising substantial funds; 17 PreK-12 academic-facing companies obtained funding in 2018; 21 corporate-focused companies producing game-based training were funded. The most attractive category for investors was educational games or educational technology products for use in K-12. China is the education technology center of the universe, at least for now, according to Sam Adkins, Metaari. In 2018, 51 Chinese game-based learning companies garnered a combined total of $539.3 million. Nearly 50% of all ed tech investments made in 2018 went to Chinese companies. “This is the first time in the history of the industry that China overtook the US. A stunning $7.22 billion was invested in 207 Chinese learning technology companies in 2018,” Adkins said. In July, Metaari predicted a 37.1% CAGR growth rate for game-based learning products over the next five years. That growth would mean revenues for games-based learning will more than quadruple to well over $17 billion by 2023. Metaari produces annual reports on the global game-based learning market. The reports, available from Serious Play Events, include an analysis of the catalysts driving the market as well as both a demand and supply-side analysis, providing publishers with the ability to choose high-yielding opportunities. Metaari also produces reports on the Mixed Reality Learning Market and the Market for Mobile Educational Games. KENSINGTON, MD. – Jan. 8, 2019 –Evolution, the strategy game of adaptation from North Star Digital Studios will flourish on PC, Mac, iOS and Android on Feb 12, 2019. 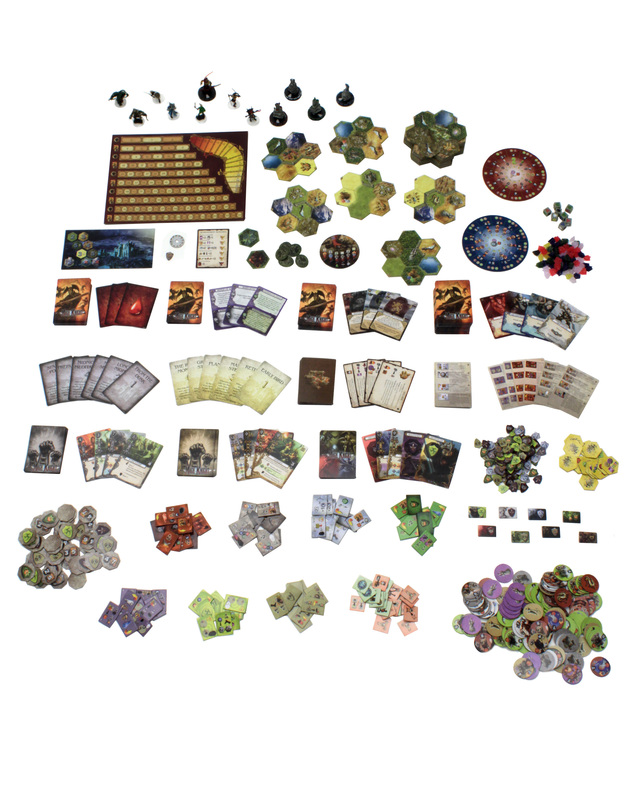 Inspired by the award-winning tabletop game, Evolution retains the elements which made the analog edition so popular with more than 1.6 million players worldwide, but offers a swift pace and features only possible in a modern video game. Meticulously designed so even those who are completely unfamiliar with the original board game can jump in right away, the digital release features a learn-while-you-play tutorial, exciting campaign mode with “Apex Species” to test your wits against, and cross-platform multiplayer that effortlessly matches players with others of similar skill. Take the fight for survival online and square off against live opponents around the world in fully cross platform, skill-based matchmaking. Rank up from a field researcher all the way to a Nobel Laureate in the progression system. Test yourself against others in the ongoing seasonal tournaments. Turn-based and simultaneous play options allow for fast and fluid multiplayer games in under ten minutes. Evolution will be available in English on PC and Mac via Steam for $14.99 on February 12, 2019. The game will also be released as free-to-try on iOS and Android with a full version available for $9.99 on the same day. Those who purchase the game in the first week will receive a 20% launch sale discount. For more news about Evolution and other projects from North Star Digital Studios, follow them on Twitter and Facebook or visit the official website. North Star Digital Studios is a digital board game development house based in Kensington, MD. Founded in 2014 by parent company North Star Games’ Scott Rencher and Dominic Crapuchettes, the company is devoted to adapting North Star board games into digital versions that capture the heart of the originals while taking full advantage of what video games have to offer. Evolution is the studio’s first release. Hillside, NJ – November 26, 2018 – WizKids is thrilled to announce that Mage Knight: Ultimate Edition, the most comprehensive version of the critically acclaimed strategy game ever created, is coming soon to a friendly local game store near you! A game of epic exploration and conquest that mixes character development, intrigue, and the clashing of swords, Mage Knight: Ultimate Edition allows players to revisit this exciting setting or experience its thrilling adventures for the first time! Pre-order Mage Knight: Ultimate Edition at your Friendly Local Game Store or online today! To learn more about Mage Knight: Ultimate Edition, click here. Editor’s Note: I have never played Mage Knight, one of the few Vlaada Chvatil games I’ve missed. I bought it once but sold it when I heard this edition was coming. I’m going to be seeking a review copy from the folks at WizKids in hopes of reviewing it here for you to give you a sense of the game. I believe we now have too many adventure games but Vlaada’s unique take on the genre intrigues me and I’m hopeful it will be the thrilling experience I usually get from his titles. More to come once I get a hold of this monster-sized new version. Tuesday, October 16, 2018 (Helsinki) – Dized, the premium tabletop companion app, is now live on Kickstarter. The smart device application brings tons of helpful content to gaming sessions. The fully-voiced, interactive Tutorials are able to react to what’s happening in the game and players are able to learn as they go, turn by turn. Thus, Dized allows the games to start immediately, straight out of the box. And Rules are like fast, searchable FAQs able to respond to all the questions players might have while playing a board game. With the success of a previous crowdfunding campaign, Dized is already available in Early Access and has a selection of handpicked pilot projects available. The reach of the Kickstarter campaign will help the company both develop the app further and widen its audience and community, which will in turn attract more publishers and content to the application. One of the many features the company is looking to develop with a successful campaign is Adaptive Profiles for Tutorials, which is a highly requested feature. While some players might want to have full depth explanations and examples, others might not. Since every group wants to learn at their own pace, the Adaptive Profiles allows learning to happen based on the skill level of that group. Also, to help expand the content in the app, the company has built and just released a toolset that allows publishers and freelancers to create Dized content themselves. The easy-to-use tools already allow the creation of Rules and Interactive FAQs to the app. Dized Rules are especially valuable to returning players, who know how to play games but want to either brush up quickly on the rules, find information quickly regarding a specific rule, or ask questions about the rules. The similar tool for Tutorials is already under development, and when finished, it will expand the Tutorial content rapidly. A successful campaign will help in the production of these tool immensely. The Dized Kickstarter launched on the October 16th, 2018 at 11AM EDT and will run for 30 days. Find the Dized campaign at https://www.dized.com/kickstarter. Founded in 2014 by enthusiastic players and game designers Jouni Jussila and Tomi Vainikka, Playmore Games’ goal is to show there is a better way to learn and enjoy board games together. While the board games industry is booming, a significant obstacle remains: learning rules is a slow and tedious process. Playmore Games’ Dized app will offer smart tutorials, setup guidance, a blazing fast rules lookup tool and other exclusive features to make the board game experience all about fun.